Your Eminences and Your Graces! Very Reverend Vladyka Longin! Your Excellency! Special Representatives of the authorities; dear Vladykas, Fathers, Brothers and Sisters; the seminary’s chairmen, teachers, and students! I would like to congratulate you on a significant event: the consecration of a church in honor of the Holy Apostle and Evangelist John the Theologian on the premises of the Saratov Theological Seminary. My heart was warmed extraordinarily when I walked inside this church, the walls of which reminded me of the church in honor of the Holy Apostle and Evangelist John the Theologian on the premises of St. Petersburg Theological Seminary. These churches are very alike in their interior, style, and decoration; and I remembered those difficult years of our Church’s life, during which I was called to be Rector of the Leningrad theological institutions. Looking at the restored seminary in the center of Saratov, at this marvelous church, I believe that our actions in difficult times and our humble efforts, together with the prayers of millions of people, who are looking forward to the restoration of the Church, have resulted in considerable changes in the life of both the people and the Church. First of all, these are prayerful efforts of the Martyrs and Confessors. Today we venerated the name of St. Thaddeus of Tver during our prayer, a person of holy life, who was severely tortured for the faith. These are the prayers of those who preserved their faith in the Lord under the harshest of conditions, and then of those who put constant effort into bringing different times closer. At the present time, all of this has been implemented, when we see the opening of churches, monasteries, and theological institutions, and when we have the great joy of consecrating these magnificent buildings, showing our heartfelt gratitude to those who put their energy, offered their prayer, and helped financially in fulfilling this noble cause. One thinks involuntarily of the future generation of Russian Orthodox clergymen inside the seminary. Remarkably, according to the Church Typicon, the Gospel of Luke was read today, in which the story of the sower who went to sow his seed is told (Luke 8:5-15). In this story it is described where his seed fell. Some fell by the way side, and the fowls of the air devoured it; some fell upon rock, and it withered away under the bright sun due to its shallow roots; and some fell among thorns, long grass, and weeds, and the weeds sprang up and destroyed the seed; and only the last part fell on good ground. Usually when we consider this excerpt from the Gospel, we try to answer the question of who we are. Are we those who are by the way side, on a rock, or among thorns? Or perhaps are we those who are on good ground? However, for some reason we never think about the sower. “A sower went to sow” and sowed his seed so widely that it fell on different ground. But who is the sower? As the Savior Himself explained, the seed was the word of God and the sower is the one who offers this seed – that is, the word – to the people. It is they who have been called by God Himself to sow the seed of His word. So what follows from this? Perhaps, knowing this parable, we should not spread the seeds so widely? Why cast it by the way side, on a rock, or into the thorns? However, the parable contains no instructions whatsoever on where to cast the seeds. That means that the sower, appointed by God Himself to plant the seeds of His word, should cast it widely. But he did not merely cast them. He tried to enrich the soil by his penetrating speech. And then leaving that place, where the seeds of God’s word had been planted, he created Christian communities, local Churches, which were intended to care for improving the soil on the way side and rocky road, and tearing out the weeds, so that the seeds that fell on a rock, or the way side, or among the thorns, would not die. A seed cannot grow if the soil is not being cultivated or fertilized, because there is a great possibility of its death. When we say that people should cultivate the soil, we use a word that has the root “cult” and “culture.” But it is not sufficient to limit ourselves to the means of cultivation, but we should certainly improve the soil and care for it. That is how the soil of people’s hearts and the cultural environment in which people respond to God’s word should be cultivated, that it be enriched so as to be able to accept the word of God and to help the seed of God’s word grow enormously. Just as in the times of the Holy Apostles, the local Churches, founded by them, conducted this mission; all of what I am saying right now is the task of the Church, primarily those whom the Lord sends to sow. And those who are studying in this institution are future sowers. Please remember that your task is to sow the seed of God’s word widely, not in a comfortable place, where your words and actions are welcomed and expected, but everywhere. Everywhere possible. But you should remember that many of the seeds you are going to spread will fall on the way side, on a rock, and into the thorns. Therefore your work of sowing the word of God and your efforts to spread the Gospel should be accompanied with great effort put into changing the lives of people for the better. In this act of improving people’s lives and soil, you should unite with those who are also willing to work toward the aim of fertilizing the soil of our national life and tearing out the weeds, which are able to choke all the good, both of the faith and of the moral principles of people; so that the soil of our national life might not be transformed into rootless rock on which nothing can grow, even if it is good, healthy, and fruitful. Finally, we should work together with many people, so that the soil of our national life might not become a foreign way side. What a tragedy that would be, if our national soil became a foreign way side of a high-speed circuit! In order to avoid this, the Church encourages people to bear a special responsibility for the spiritual life of the people. Future shepherds should remember that their domain will be not merely serving in churches and parishes, or with like-minded people, but with the whole people. When you are walking down the streets of Saratov, everyone you see is a member of your people, your pastoral responsibility. Turn your attention away from the place where you feel comfortable and calm to those streets, squares, those roads, and those people, who are yet not able fully to grasp the word of God, who are yet among the thorns, on the way side, and on a rock. The cultivation of our people’s soil, as I have just said, should be conducted with those who are ready to work with us. Among them are representatives of science, education, and culture; indeed the word “culture” has the same root “cult.” Only that which enriches people’s life and national soil can be called culture. Things that plant terrible weeds on this soil, which are capable of suppressing the growth of a healthy seed, can never be called culture under any circumstances, especially a rootless rock or way side open to all winds. Today being a clergyman means scaling the most difficult and greatest heights. Some people believe that the ministry of a clergyman is limited to performing rites and following exterior church statutes. However, in reality your activities are the future of the people, the future of people’s hearts and the human mind. I would like you to remember these words forever, my dear students and teachers, and also the representatives of our intelligentsia, scientists, educators, writers, actors, intellectuals, political figures, and businesspeople. Let us cultivate our national soil together, doing everything to make even way side and rocks fertile. Let us join our efforts to tear out the weeds and not let them grow in order to choke the vital seeds of the national and personal lives of our people. We believe that, by the grace of God and the prayers of Holy New Martyrs, who laid down their lives for us, confessing Christ; and by the prayers of those who worked before us to gather the beauty that we are witnessing now on the territory of our Motherland; that by their prayers and our own efforts the Lord will enrich the soil of our people, making it fertile, indeed so fertile that not merely we could receive and use the gifts and fruit of this enormous growth, but also our children, grandchildren, and our grand-grandchildren. We are working hard today toward this aim: we build churches, open schools, and encourage everyone to work with us. 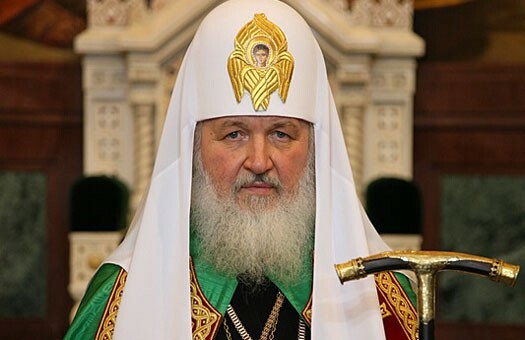 I would like to heartily thank you, Your Eminence, for your efforts as a hierarch and the Metropolitan of the Saratov land. Many good deeds have been performed with your help. One can point out that church life in the Saratov land has changed beyond recognition. Now you preside over a metropolia consisting of three dioceses, you control a theological institution, many schools, Sunday schools, different charitable institutions, and many things that help to fertilize our soil. In acknowledgment of this, I would like to present you with this Cross and Panagia, which were made specially in association with the 700th anniversary of the birth of the Venerable Sergius of Radonezh. I would also like to present this church with an icon of the Venerable Sergius associated with his anniversary. St. Sergius was a great saint of our land, a great and powerful Elder, who managed to transform the political landscape with his inner spiritual strength. No one could influence the future development of our Motherland the way he could. Many valuable events occurred because of him, including the Battle of Kulikovo, the union of the Russian principalities, and the foundation of dozens of monasteries, which preserved his principles and took extra care for the unity, freedom, and independence of our Motherland, becoming fortresses, often both military and spiritual. May the image of the Venerable Sergius remain in this holy church and, when you are venerating it, ask him for his help in your studies. As he improved and became able to understand his studies by God’s strength, he too can he help many students by his prayers who cannot grasp their studies completely. I would also like to offer Holy Relics to the wonderfully restored St. Nicholas Monastery, which is situated in the Pokrov Diocese. May these sacred objects stay in that monastery. Unfortunately, I do not have the opportunity to visit this place myself today due to lack of time, but I am asking you, Vladyka Pachomius, to offer these Holy Relics to the St. Nicholas Monastery. As for the seminary, I would like to present it with these marvelously issued books in remembrance of my visit. Congratulations on the feast day to all!